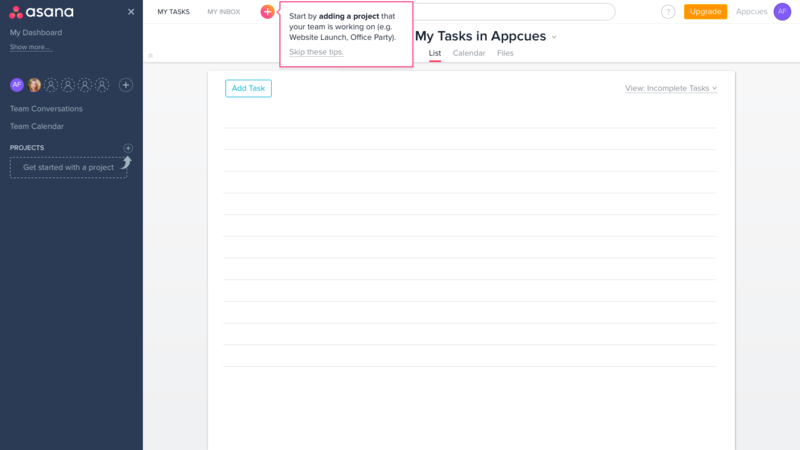 Asana uses a small and delightful hotspot to drive attention to a key task (adding a project). The hotspot is in an unusual droplet shape and pulses until the menu is clicked. It really catches attention. The hotspot appears to be targeted to new users who haven’t done much in the product yet. Small reminders are a good way to get people going. Adding a project is probably a major point of value for Asana users, but users aren’t forced through the task. Users can take any number of other tasks to get started.